Boulder, Colo., USA - Seismic, deformation, and gas activity (unrest) typically precedes volcanic eruptions. Tracking the changes of this activity with monitoring data makes it increasingly possible to successfully forecast eruptions from stratovolcanoes. However, this is not the case for monogenetic volcanoes (usually the result of a single magmatic pulse). Eruptions from these volcanoes tend to be small but are particularly difficult to anticipate since they occur at unexpected locations, and there is very limited instrumental monitoring data. Many monogenetic volcanic fields occur in high-density, populated areas and tourist destinations (e.g. Canary Islands, Auckland City, Mexico City, Izu-Tobu volcanic field), and thus even a small eruption can have a major economic and societal impact. Helena Albert and colleagues have compiled historical accounts of felt seismicity and combined this information with petrological studies to propose a new conceptual model. Albert and colleagues show that seismic crises occur about a year, two to three months, and a few weeks before eruption, and that these correspond to magmatic intrusions and mixing at mid-crustal depths, followed by magma transport to the surface. They propose a general model for these eruptions in which early dike intrusions in the crust do not erupt (e.g., stalled intrusions) and make small plumbing systems, but they probably are key in creating a thermal and rheological pathway for later dikes to be able to reach the surface. 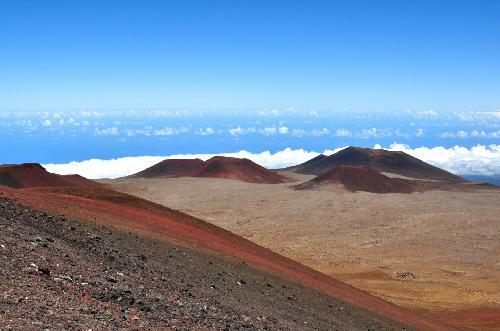 Monogenetic cones at Mauna Kea (Hawaii, USA). Photo by Helena Albert. Credit: Geology and Helena Albert. These observations provide a conceptual framework for better anticipating monogenetic eruptions in similar settings and magmatic fluxes and should lead to improved strategies for mitigation of their associated hazards and risks. Helena Albert et al., Central Geophysical Observatory, Spanish Geographic Institute (IGN), 28014, Madrid, Spain. This article is open-access online at http://geology.gsapubs.org/content/early/2016/02/05/G37239.1.abstract. Fabian B. Wadsworth et al., Earth and Environmental Sciences, Ludwig-Maximilians-Universität, Theresienstrasse 41, 80333 Munich, Germany. This article is open-access online at http://geology.gsapubs.org/content/early/2016/02/05/G37559.1.abstract. The movement of pressurized fluids through a volcano or Earth's sedimentary crust and escape is a crucial process to constrain. It helps us to interpret gas fluxes we measure at the surface, or to predict when fluid-driven fracturing will or will not occur at depth. But to understand these processes, we need to know how permeable geologic materials are. This key parameter has remained confined to case studies in which single rock-types are tested and a relationship is proposed. However, in this study, the authors propose that a fundamental relationship exists in which a few simple geometric parameters can be used to predict how permeable a rock will be. More than this, the investigators show that knowing how permeable the sediment or volcanic ash was when it was first deposited is sufficient to know how the permeability will change when the deposit is buried, compacted and undergoes diagenesis at depth. This will help us to predict catastrophic events such as gas-driven volcanic eruptions and borehole failure during resource exploration. B. Debret et al., Department of Earth Sciences, Durham University, Elvet Hill, Durham DH1 3LE, UK. This paper is open access online at http://geology.gsapubs.org/content/early/2016/02/05/G37565.1.abstract. Subduction zones are the geological setting where one plate is dragged beneath another into Earth's interior. These zones are the main place of chemical and fluid exchange between Earth's surface and interior and are associated with active volcanism and high concentrations of ore-forming metals. We have used Fe isotopes in samples of subducted plate material to study the chemical reactions that take place during subduction. Our results show that iron, which is usually considered as immobile, is mobilized in fluids lost from the subducting plate. The mobilization of iron could be triggered by the presence of sulfate and chlorine in fluids. Such fluids are highly oxidizing and capable of mobilizing many other elements, including ore-forming metals like copper and zinc. The migration of these fluids from the subducted plate to the overlying mantle is likely to be an important factor in controlling the chemistry of arc magmas in subduction zones. Renato Paes de Almeida et al., Instituto de Energia e Meio Ambiente, Universidade de São Paulo, Avenida Professor Luciano Gualberto, 1289, São Paulo-SP 05508-080, Brazil. This article is online at http://geology.gsapubs.org/content/early/2016/02/05/G37534.1.abstract. This contribution aims at an important question regarding the evolution of sedimentary systems through time, namely the nature and characteristics of rivers developed in low-lands before the first appearance of land plants. Since the efficiency of the sedimentary transport through these low slope gradient areas is dependent on the channel style, the characterization of the pre-vegetation equivalents of the post-Silurian meandering rivers is of great importance to the understanding of the sedimentary global-scale dynamics in Precambrian and Early Paleozoic times. The conclusions are based on the integration of numerical modeling with field data from excellent exposures of a Mesoproterozoic succession from northeastern Brazil, enabling the proposition of new models for these non-actualistic depositional systems. Beyond the importance for the field of Precambrian geology and fluvial depositional systems, it is possible to foresee the potential interest of a broad audience among earth scientists, with far-reaching implications ranging from regional mineral prospection in alluvial and coastal deposits to the modeling of mass transfers and responses to tectonic and climatic forcing. Antony Morris, School of Geography, Earth and Environmental Sciences, Plymouth University, Drake Circus, PL4 8AA Plymouth, UK; and Marco Maffione Department of Earth Sciences, Utrecht University, Heidelberglaan 2, 3584 CS Utrecht, Netherlands. This article is online at http://geology.gsapubs.org/content/early/2016/02/05/G37529.1.abstract. Ophiolites are slices of oceanic crust and upper mantle tectonically emplaced above sea-level. By exposing oceanic rocks at the surface, they provide opportunities for detailed study of the processes operating during seafloor spreading. One of the best-known ophiolites occurs in the Troodos mountains of Cyprus. This formed ~90 million years ago in the Late Cretaceous, and studies of ancient magnetizations locked into its rocks can help quantify the styles of deformation that occurred during its formation. This new study uses paleomagnetic data from upper crustal rocks in the relatively unexplored northwestern region of the Troodos ophiolite to establish for the first time that a major oceanic fault zone marks its northern margin. Movement along this oceanic transform fault during seafloor spreading resulted in clockwise rotation of small fault-bounded blocks in response to shearing, with rotations increasing in magnitude as the transform zone is approached. This newly recognized "Northern Troodos transform fault" and a similar, previously identified structure along the southern margin of the ophiolite, together define the limits of the oceanic ridge segment that produced the Troodos crust. The length of this segment is consistent with formation at a slow-spreading rate and in a setting above an intra-oceanic subduction zone. Susan H. Little et al., Department of Earth Science and Engineering, Imperial College London, London SW7 2BP, UK. This article is online at http://geology.gsapubs.org/content/early/2016/02/05/G37493.1.abstract. Like us, microscopic oceanic plants (called phytoplankton) need nutrients, like zinc (Zn), to grow. As they build their bodies, phytoplankton take carbon dioxide from the atmosphere, converting it into solid organic material. When they die this organic material sinks, and the carbon it contains is transported to the deep ocean, and trapped. This process, the "biological pump," is one control on climate. Scientists would like to answer the question: was the biological pump different in the past? Was it more or less efficient, with a knock-on effect on climate? Various geochemical techniques have been developed to try to find out, including measuring Zn isotopes in ocean sediments. As yet, however, we don't fully understand the modern ocean cycle of Zn and its isotopes -- that is, the sources of Zn to the ocean and the places and ways in which it is removed (the Zn "sinks"). This knowledge is crucial. Here, we show that organic-rich sediments deposited on the margins of continents are a significant sink for Zn, and specifically for light Zn isotopes. This observation helps to balance the modern ocean Zn cycle, and challenges the view that Zn isotopes in ocean sediments reflect the efficiency of the biological pump. A. Heinonen et al., Department of Geosciences and Geography, Division of Geology and Geochemistry (DiGG), PO Box 64, Gustaf Hällströmin katu 2a, University of Helsinki, 00014 Helsinki, Finland. This article is online at http://geology.gsapubs.org/content/early/2016/02/05/G37696.1.abstract. Age determinations of granitic rocks are based on measuring the uranium and lead isotope compositions of the mineral zircon. In many cases the precision of these measurements has been observed to suffer from slightly older zircon crystals that crystallized at an earlier stage of the magmatic evolution of the granites. This study comprised three samples from the ca. 1.63 Ga rapakivi granites of southeastern Finland. A special microdrill sampling method was employed in order to extract zircon crystals from within large (up to 15 cm) alkali feldspar crystals that may have crystallized earlier than their host rocks. The uranium and lead isotopes and the trace element compositions of the zircon crystals were measured and compared to results from zircon extracted from the groundmasses of the host rocks. The results show that the large alkali feldspar crystals were most likely crystallized significantly earlier and from magmas with different chemical composition than their host rocks. Furthermore, the groundmasses of all studied granites were observed to be of similar age, ca. 1628 Ma. These observations lead to an enhanced geochronological interpretation of the studied granites and potentially provide a new method to study the different types of zircon in granitic rocks. Nikolaus Froitzheim et al., Steinmann-Institut, University of Bonn, Poppelsdorfer Schloss, 53115 Bonn, Germany. This article is online at http://geology.gsapubs.org/content/early/2016/02/05/G37545.1.abstract. When two continents collide, one of them may be subducted, i.e. forced deep down into the Earth's mantle where it is metamorphosed under high-pressure conditions. Thereby, basaltic rocks are transformed into eclogite. The basement rocks of the Lofoten islands in Northern Norway, located in the Caledonian collision zone where Baltica and Laurentia collided about 400 million years ago, were only weakly deformed during the collision but they do contain eclogite. Newly discovered kyanite-bearing eclogites from the Lofoten islands record metamorphism under pressure of 2.5-2.8 GPa and temperature of ~650 degrees C, indicating that they were subducted to a depth of ~90 km. Using the Lu-Hf decay system on garnet, the eclogite formation was dated at 399 plus or minus 10 million years, which is the time when continent collision reached its climax. The rocks returned to a shallow level soon after. These results demonstrate that during continent collision, subducted continental basement rocks may stay rigid down to a depth of ~90 km and may return to Earth's surface almost undeformed. Christophe Ballouard et al., Géosciences Rennes, UMR CNRS 6118, OSUR, Université Rennes 1, 35042 Rennes Cedex, France. This article is online at http://geology.gsapubs.org/content/early/2016/02/05/G37475.1.abstract. In their late stages of evolution, peraluminous granitic melts exsolve large amounts of fluids which can modify the chemical composition of granitic whole-rock samples. The niobium/tantalum (Nb/Ta) ratio is expected to decrease during the magmatic differentiation of granitic melts, but the behavior of both elements at the magmatic-hydrothermal transition remains unclear. Using a compilation of whole-rock geochemical data available in the literature, we demonstrate that fractional crystallization alone is not sufficient to explain the distribution of Nb-Ta in most peraluminous granites. However, we notice that most of the granitic samples displaying evidence of interactions with fluids have Nb/Ta <5. We propose that the decrease of the Nb/Ta ratio in evolved melts is the consequence of both fractional crystallization and sub-solidus hydrothermal alteration. We suggest that the Nb/Ta value of ~5 fingerprints the magmatic-hydrothermal transition in peraluminous granites. Furthermore, a Nb/Ta ratio of ~5 appears to be a good marker to discriminate mineralized from barren peraluminous granites. Shaul Hurwitz et al., U.S. Geological Survey, Menlo Park, California 94025, USA. This article is online at http://geology.gsapubs.org/content/early/2016/02/05/G37478.1.abstract. Dissolved gases reduce the boiling temperature of water and increase the explosivity potential with respect to pure water. Therefore, in areas where magma is actively degassing into a hydrothermal system, gas-rich thermal waters enhance geothermal energy production, can be propellants in hazardous hydrothermal (phreatic) eruptions, and can modulate the dynamics of geyser eruptions. To provide a better understanding of the processes controlling hydrothermal and geyser eruptions, pressurized samples of thermal water that preserved dissolved gases were collected from a research well and thermal pools in the Upper Geyser Basin of Yellowstone National Park. The data in conjunction with thermodynamic calculations demonstrate that carbon dioxide mainly derived from magma and nitrogen from meteoric water reduce the near-surface boiling temperature of thermal water. These findings imply that dissolved gases modulate the dynamics of geyser eruptions and are likely triggers of hydrothermal eruptions when recharged into shallow reservoirs at high concentrations. Thus, monitoring changes in gas concentrations and compositions of thermal waters could provide important information on the natural resources (geysers) and hazards (eruptions) in these areas.